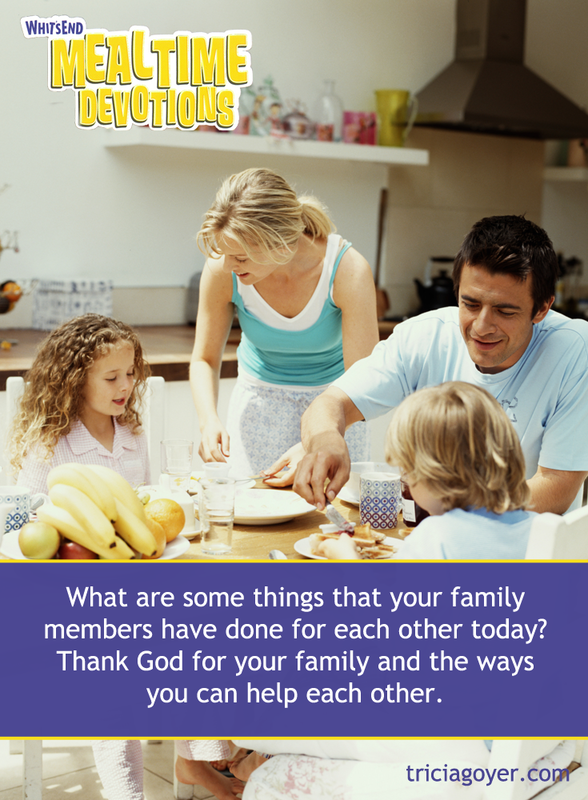 What are some things that your family members have done for each other today? Thank God for your family and the ways you can help each other. How do you feel when you do something nice for someone else and he or she doesn’t thank you for what you’ve done? Have you ever forgotten to thank someone for doing something nice for you? The Bible tells us that, one day, Jesus healed ten men who were sick with a disease called leprosy (Luke 17:12-19). Only one of them men took time to thank Jesus for healing him. How do you think Jesus felt about this? Why do you think the other nine men didn’t thank Jesus? What is it important to say thank you to our friends and family for things they do for us? Why is it important to thank God for what He does? What things do we take for granted but should be thankful for? How does it help our relationship when we remember to show gratitude? What a thank-you note to someone, and give it to him or her tomorrow. The winner of the last Whit’s End Mealtime Devotions giveaway is Melinda!